Meanwhile, back at the ranch, Bernie quietly ditches the Canadian GP. The race is absent from the 2009 calendar put out by the FIA today - and that is all we are told. It is surely indicative of how little the governing body and its masters care for those who actually follow the sport - we are not worth an announcement or prior warning, apparently. There were some indications earlier this year that the race might be under threat but it went ahead and everything seemed to be sorted out. The demise of the USGP meant that Montreal could no longer share the expense of bringing F1 to North America with Indianapolis and this caused a few murmurings. Yet everything went quiet after that and this sudden cancellation seems precipitate, to say the least. Negotiations may have been going on in the background but the fans have not been given a hint of trouble. One is tempted to think that this may be one of Bernie's ploys to put pressure on the organizers. It is typical of his style to blackmail circuits in such a way and he may be demonstrating his willingness to cut the race if his demands are not met. Easy enough for him to say, "Oops, did we leave out Canada?" if the organizers find some extra cash. This would be the first time that a GP were dropped without any prior indication whatsoever, after all. If that is so, it is time that Bernie took his games and played elsewhere. We saw how his strategy failed to extract more money from the Indy organizers and we have no USGP now as a result. There has been some outrage amongst the manufacturer teams at this, particularly as the amount offered by Tony George came very close to what Bernie was asking - some sponsors have said that they would happily have paid the difference if only they had known what was going on. But Bernie does not seem to have learned the lesson. If there have been negotiations with the Canadian organizers, they have been even more secret than those at Indy. This surely indicates that the little dictator becomes ever more convinced that he has the right to include or scrap GPs as and when he sees fit. The fans must just accept what he offers and continue to pay whatever he asks. It is not as if I do not understand the pressures on Ecclestone, either. He has managed to sell the sport to the faceless investor that is CVC and they become nervous at the amount they are having to pay back in interest on their loans. Bernie has to maximize income to keep his employers happy. But that is hardly the concern of the sport; if CVC has over-reached itself, that is their problem and they deserve whatever comes of the economic downturn. In fact, it makes no sense to cancel the Canadian GP for economic reasons. Even if the organizers cannot pay as much as Bernie is asking, at least they are prepared to pay a substantial amount - and that is money CVC will not see if there is no GP. It looks to me as though Bernie has made a serious miscalculation this time, alienating the fans, the organizers and even his paymasters in one fell swoop. The whole episode shows once more how wrong it is for one man to have all the power of authorizing GPs. We have allowed him this because we are so often told that he built the sport into the multi-million dollar industry it has become. But that is not all it is; it remains a sport that was in existence long before Bernie added it to his empire and it will still be here if CVC collapses overnight. There are some things about F1 that you cannot change without the sport becoming something else entirely. One of these is the nature of certain circuits - get rid of Monaco, Spa and a few others and the thing will no longer be watchable. A succession of Tilkedromes will not retain the huge audience that has grown over the years. Lose the audience and Bernie, CVC and everyone involved in the sport goes bankrupt. I am not saying that F1 cannot survive without the Montreal circuit - there is no doubt that it can. But the way in which the GP has been summarily cut from the calendar leaves everyone wondering whether anything is sacred. 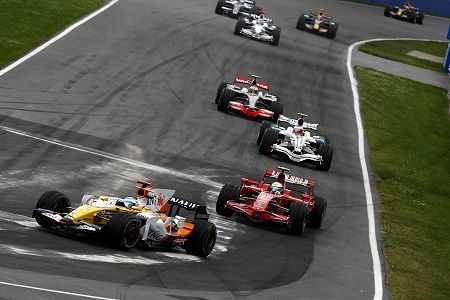 The Circuit Gilles Villeneuve may have had its problems but it is much loved even so, being the last outpost of F1 in North America and a place that often gives surprising results that shake up the season. If Bernie is adamant that it has to go, it may be the catalyst for his own departure, a cause for the manufacturer teams to unite around. They know where their largest market is, even if Bernie does not. And that is the insanity of this decision. While the manufacturers have been pressing for the return of the USGP and the signs are optimistic for its reinstatement, Bernie is so detached from reality that he burns another North American bridge. Even if it is just a negotiating ploy, it risks severe disillusionment with a large sector of F1 participants and enthusiasts, thereby hastening the day when CVC will have to replace the man who destroyed F1 racing in the States. This cannot continue for long. While the racing gets better every year, the governing bodies are revealed as the incompetent, corrupt and greedy organizations they have become. The cancellation of the Canadian GP must surely be one more step towards complete re-organization of the way F1 is governed. Let those who care examine the fate of open wheel racing in the continent F1 has abandoned and let them fear for the future. Much as I am outraged at the decision to remove the Canadian GP from the calendar, in some ways I am happy to see it gone from my country. Ecclestone has been bullying those who put together this race for years. Last year he made them spend millions to update facilities with the threat of cancellation hanging over them. They complied and still he cancels the race, or at least tries to bully them out of more cash once again. I've been going to the Canadian GP since it was held at Mosport and have steadily seen the prices go up and the value for dollar drop. I am pleased that there will be one less reason for one documented deviate to spend time here. I am pleased to have one less self serving dictator have occasion to set his feet in the fine city of Montreal. We have a long history of motor racing in this country, much of it shared with the USA and the removal of this sort of greedfest will make room for healthier and more equitable venues in the future. Had this happened 20, or even perhaps 10 years ago the loss would have been catastrophic. Now, I don't think we're losing so much. The sport is sick with greed. I expect to outlive these two bullies. I think I'll put a personal embargo on their product until they are confined to where senile people belong. It says much for the resilience of F1 that it has survived so many years of abuse by such awful administrators. There comes a point where even the greatest must fall, however, and I suspect that F1 is fast getting there. Just how much more can the fanbase put up with? Well that decision came out of left field. Did anyone see this coming? It's got to be a ploy by B. Ecclestone...doesn't it? How could any reasonably sane person cancel the Canadian GP? It's just so...jeez, what's next? Apparently neither FOM or the FIA informed the Montreal officals of the decision. The organizers learned of the cancellation through the media. This whole situation seems odd and strange to me. I just don't get it. It`s not April 1st again is it?. Just when you think it cant get any worse. I dont no whether to laugh or cry, its like a nightmare that you know will never end. Before I started to delve into the Politics of F1, I used to sort of like Bernie `The funny little Man of F1` but I think of him now as a poision dwarf. I am lost for words, can we as a fanbase organise a petition of sorts, not that it will achieve much, except to tell Bernie and his bum chums that we are disgusted with what he is doing to OUR sport, cos without us they are nothing. Not that I dont believe you Clive, but Iam off to see it with my own eyes, then Iam going to get drunk, and raise a glass to the former pinnacle of Motor Racing. RIP Formula One. Your not wrong Clive, After google Earthing Yas Island Abu Dhadi Race Circuit, its dated March 3rd 2007, but all it shows is a field( check out the Airplane at the 11 o clock position),Could it be that the circuit might not be up to scratch, and Bernie is pulling a fast one, as we speak he`s probably speaking to the Canada GP organisers, who are probably bending over backwards and promising the Earth, to be the back up, please no-one reply with, its up and running, I can feel the gloom lifting. This is really rather strange indeed - I couldn't believe it when I read it at Keith's site.I hope this is a typo and someone will come out with a corrected version , knowing what the FIA's secretaries are like.I'm sure it would be a breach of contract by the FIA if they won't hold a race at Montreal next year seeing as there was supposedly an agreement until 2011. It's disgraceful how Bernie's treated North American fans.He seems to have forgotten this is the Formula One World Championship of late with all the talk of changing the start times of flyaways to suit European audiences. This has been the first thing mentioned on the news every half hour here (Quebec City). Apparently Norman Legault , the organizer, is said to be on close enough terms with Ecclestone that he was asked to go and visit China's instalment and get back to him (Ecclestone). Despite this, he hasn't been told anything about the decision.Nobody in Montreal has been told anything by the FIA or F1 management. Many think it is the same basic hoax pulled by Ecclestone in 03, and are in disbelief. I guess it doesn't pay to be friends with their like. Bernie has only one friend - it's rectangular, green and has a President's face printed on it. Yas Island will be ready in time for the Abu Dhabi GP, Gusto. It is one of those "cost no object" schemes done purely for the prestige it gives the host country. And I don't see it being taken out at the last minute to be replaced by the Canadian GP - Montreal in November is just a tad too cold for F1 cars! This is either a huge foul-up courtesy of the FIA or some sort of devious scheme for Bernie to get what he wants. Whichever it is, we should not be amused; the last thing we need right now is yet more evidence that F1 is run by a bunch of deviants and crooks. Now, I assume to get the USGP back in America, we will need to get Canada (America Jr.) back on the calender as well. It only makes sense to run both races one after the other to save on traveling cost. I'm going to go out on a limb here and say Bernie would never cut the British GP from the calender regardless of how profitable the GP is. That seems a pretty flimsy limb to be going out on, Aracer - many people reckon the whole Donington GP thing is just so that Bernie can say, "Hah, you didn't get it ready on time, no more British GP!" Never count on Bernie's schemes making any sense at all unless they're putting money into his pocket. Damn #U&~## B##*&* S*#%#, Barman make it a treble, I forgot that Canada`s biggest Import is Snow. Even though I love Donington, after `that` opening lap by the Master, theres something about Silverstone that is unique, for God`s sake has Bernie forgot that was were F1 was born, to think its losing the race because the Prawn Sandwich Brigade cant sit on Solid Gold toilets is just so depressing, especially when you think they woundnt know a F1 car if it run them over (Ferrari are good at that sort of thing ). And as you say,you can tell that the Poison Dwarf has an agenda that doesn`t have a happy ending for either circuit. I dare`nt go to an F1 race incase I got within swinging distance of him. "No, we’re realistic. They’re not allowed to call Bernie a poisonous dwarf with a pet ginger monkey with an overriding sense of his own importance. For stuff like that you have to come here." It's also not particularly nice to remove a race from a city without any warning, after that city has put millions in your coffers and received you like royalty. The list of "not nice" deeds of these two is probably as long as the rule book. Remember, Bernie has to make room on the schedule for Abu Dhabi, India, Russia,(Bernie should feel right at home there, the home of soulless dictators) and who knows where else they have big bags of cash. As an aside, in this economy, I'm sure Bernie prefers Euros, or maybe gold bars. So, he is squeezing out the low rent GPs. England is shakey, France is on notice, Belgium has been on his bad side for years and Canada and the US are gone. I'm sure he is negotiating with Faroutistan as we blog. He has no respect for history or tradition so we should expect nothing else. Oh, and they fans mean nothing to him because we really don't directly affect his income. I despair of F1 on an almost regular basis now. F1 has always been an expensive sport, but now it is just a money racket. A package deal series for any country, no matter how bent, repressive or lacking in racing event expertise, to host a Grand Prix for the glory of their governments. Bernie does the deal and Tilke designs a naff track for them. The top teams coo over how lovely the hospitality suites, are while the punters wonder why they paid so much money to sit in a grandstand that doesn't face the track (Valencia). Meanwhile other venues such as Silverstone are pressured to upgrade their already adequate facilities or face the threat of losing their GP. Bernie then berates them constantly, despite the fact that they already pay him so much to host the event they are having trouble to find the money to update the facilities (i.e. the Paddock club's facilities as sponsors come first, not punters). Once the track has nearly bankrupted itself to meet the demands, Bernie takes the GP away. This is because some Arabian Prince saw a stock car race at the weekend on ESPN and wants his own track and Grand Prix. History, principles and safety concerns get thrown out the window once a suitcase full of dollars is opened on the table. I am getting fed up of this now. Silvestone went through the same problems of Bernie blackmailing them (and unbelievably the British government!) to get them to spend money upgrading the circuit. They finally get a plan together and the finances to fund the imporvements (things which can take quite along time to achieve) and Gollum cancels Silverstone in favour of a circuit that is further from what he wanted in the first place! Now I like donnington and it is much closer to where I live but there is just something about silverstone that I love. Now he has doen the same thing to montreal which is second only to Monaco in terms of quality street circuits in my opinion. It is certainly far better than Valencia and Singapore. However we should not be surprised as he has shown contempt for fans before and is now also doing so in Football. He owns QPR along with briatore and they have set the ticket prices at £50!!!! Most other clubs are around the £25-£30 mark. In fact some away teams have refused their allocation of tickets due to the price. He is a collector of money and nothing else matters. If he destroys a football club or F1 in the process then so be it. Talk of the Devil,and he shall appear, not 1 minute after my last post who should pop up on News 24 but Max Mosley talking about going to the European court of Law to get him and his party chums (probably the some of the judges) more rights to protect us from news of He`s vile lifestyle........Arr shall we play the Panza Commander and the Milk Maid ,come Sir Rodney neep neep neep..
Every comment I've seen on the net is incensed over this summary cancellation of the Canadian GP. It appears that the organizers may not have managed to pay the full amount of Bernie's fee as yet and this is the reason for the omission from the calendar. The lack of negotiation indicates that Bernie was just looking for an excuse, however, and once again the wishes of the fans are ignored. Strangely enough it was viable last year and the years before, and now they are planning on making great savings to the cost of the teams. Obviously the greedy b-----d expects exponential raises in his "salary." At the time he dropped the bomb, millions were already being spent to meet the contract agreements that were part of the three year contract he signed with local promoters last year. This is why F1 needs to be rid of both Bernie and Max as soon as possible. They are both living in a dream world of their own making and are doing serious damage to the sport. You are absolutely right Clive. I am kicking a dead horse. Still, even if Max and Bernie's ears are stuffed full of dollar notes (or more likely interest repayment invoices from the Royal Bank of Scotland), at least there's a good chance their successors might be listening. Not necessarily the direct ones, but the ones who will actually fix the problems and make F1 a sport again. fill Canada’s void at a much reduced cost. The mere thought of allowing Bernie to tap into the national coffers of any host county in an effort to satisfy his insatiable appetite should have the citizens recoiling in horror. If other organizers reacted in a like fashion and refused to pay his extortion, how long could this current administration stay in business? The demand for an original F1 type series would still exist and could be quickly transferred to new management with a more realistic mandate, rather than have us endure even more painful years as the series is systematically strangled to death. I am from Turkmenistan and bad know English, please tell me right I wrote the following sentence: "Mortgage life insurance leads life pet insurance new york life insurance life insurance no physical life insurance life insurance lead." Thank you so much for your future answers ;). marketing insurance leads.